Advocacy, as NCCS defines it, is a continuum that begins when an individual is diagnosed with cancer. NCCS believes that at this defining moment, an individual with cancer (and/or a significant person in his or her life) must play a very active role in assuring that they receive quality care. What Is Self-Advocacy and How Does It Apply To Me? Self-advocacy does not mean that you have to wave a banner, give speeches or take to the ramparts. In the personal context, it means that you arm yourself with the tools and skills necessary to feel comfortable about asserting yourself and communicating clearly about your cancer care needs. It ultimately means that you are taking responsibility and assuming some control of your life circumstances with cancer. Dr. Patricia Ganz, a founding member of NCCS and a respected oncologist, wrote: Knowing as much as possible about your disease, its treatments and its potential effects on your body can empower you to take charge of your health and help you make the most of your survivorship experience. It is imperative that survivors, their health care providers and other supporters become effective advocates in the current environment of rising health care costs and restrictive referral policies. Health care professionals are also experiencing ongoing pressures such as nursing shortages and restrictive reimbursement policies for health care services. These all have an adverse impact on the care we receive and the system in which it is provided. Our interdependency on one another for responsible advocacy can strengthen the health care environment in which we are treated for cancer. By being a proactive, educated cancer consumer/advocate, you can impact the quality of your life and the health care you receive. Ellen Stovall, cancer survivor and NCCS President and CEO and Elizabeth Johns Clark, PhD, MSW, have identified and written about some of the important reasons for self-advocacy. Advocacy gives you some stability and a feeling of regaining some control in your life. Advocacy is confidence building in the way it helps you face challenges that seem insurmountable. Advocacy is a way of reaching out to others. It can be as simple as asking your doctor or nurse for the name of someone to talk with who has survived your particular type of cancer. Advocacy can improve your quality of life. Commitment to shared responsibility with your medical team can contribute to the goal of physical, emotional, and mental health. We are all cancer advocates – ourselves, our families, friends, health care professionals, and caregivers. It is anyone taking the necessary steps to play an active role as an informed, communicative decision-maker about treatment and quality-of-life after a cancer diagnosis. It is anyone reading and using the suggestions in this handbook. It is anyone empowered by NCCS’s Cancer Survivors’ Bill of Rights. It is anyone advocating on behalf of themselves, or others, at the personal, community, state or national level. We are part of a growing constituency of people living with, through and beyond cancer. What Role Does NCCS Play in Empowering Survivors and Promoting Self-Advocacy? Many excellent cancer organizations play a role in advocating for individuals with cancer. Many of them also fund research, provide professional and patient education, and/or offer support services. These organizations are principally governed by physicians and professional caregivers and have a very important voice in the cancer community. NCCS prides itself on working with all of them. The origins of NCCS are different and at the same time, similar to many of the patient advocacy organizations that provide information, support and advocacy on public issues for specific types of cancer, such as breast, prostate, ovarian, lung, colorectal, leukemia and lymphoma. Most organizations that deal with specific cancers were founded by individuals (and/or their caregivers) who were diagnosed with these specific types of cancer. NCCS is one of a handful of national cancer organizations founded by individuals with all types of cancer and their caregivers and health professionals. Because we don’t focus on one type of cancer, our educational programs and publications provide general information that can apply to any type of cancer. We develop all our programs, publications and policies from the perspective of cancer survivors and their advocates. This means that we’ve been there, having experienced cancer personally. We have learned to marry our personal experiences with cancer with the evidence that underlies good science and health policy. Next, we take the passion we feel as survivors into national forums that determine health care policy. Based on a review of survivorship research and writing, Elizabeth Clark and Ellen Stovall identified four primary, but interconnected areas, in which self-advocacy skills are essential: information-seeking, communication, problem-solving and negotiation. These skills can be self-taught and The Cancer Survival Toolbox® , developed by NCCS and several professional organizations, provides self-help assistance on these and other topics. Information Seeking skills are developed by educating yourself as thoroughly as possible about your cancer, your treatment options, possible side effects and available support services. You have probably heard the tagline for a national retailer that states “an informed consumer is our best customer.” This is especially true when dealing with cancer. Communication skills development is designed to help you organize your thoughts before you speak. Your communication skills can be applied to thoughtful interactions with your family, friends and caregivers, thereby increasing your knowledge and avoiding unnecessary misunderstandings. The How to Talk to Your Doctor section on this site addresses many of the concerns and questions that you may have and provides a guide for effectively communicating them to others. Problem-Solving skills can be also thought of as decision-making skills and are essential to the process of becoming an active, rather than passive, survivor. It is important to identify the problem and know how to articulate it – whether or not to have treatment and, if so, what type of treatment; considering a clinical trial; what physician to choose; and so on. Do not feel that you have to make decisions alone. The team approach often serves as the best way to tackle a problem. Negotiation skills are necessary in every aspect of life, whether dealing with cancer or any other challenging life circumstances. Some of us are better at negotiation than others, but all of us can achieve some degree of skill in this area. Negotiating in order to get your needs met may require you to step out of your normal comfort zone. This does not mean that you become confrontational, but rather that you negotiate about issues that are of personal importance such as the accommodation of unconventional hours at your office or persuading your insurance company to cover a test or procedure. Being proactive: Apply these skills – Now that you know why self-advocacy is important and how to acquire the necessary skills, you must actively apply them to your personal experience. Three words appear often throughout this handbook: survivor, survivorship and advocacy. The NCCS Charter reads as follows: From the moment of diagnosis and for the balance of life, an individual diagnosed with cancer is a survivor. In 1986, the founders of NCCS put the term survivor into our dictionary of terms to replace “patient” or “victim” to describe someone diagnosed with cancer. 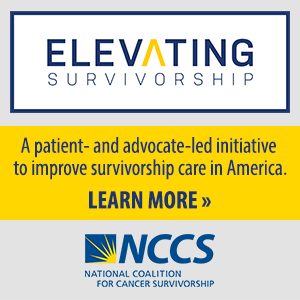 The word survivor is often debated, but NCCS persists in using it because of the proactive approach it emphasizes when living with a diagnosis of cancer. The founders of NCCS also extended the term survivor to apply to an individual’s friends and caregivers. The term survivorship, as defined by the founders of NCCS, is the experience of living with, through and beyond a diagnosis of cancer. NCCS includes the process of dying well as the last stage of survivorship. It is NCCS’s belief that by living and dying well with cancer, an individual and all those who care for him/her, will pass on a legacy of survivorship to all those they come in contact with. The term advocacy is frequently used to encompass activities carried out in the name of supporting a cause. The dictionary defines advocacy as “active support, as of a cause, idea or policy.” Advocacy, as NCCS defines it, is a continuum that begins when an individual is diagnosed with cancer. NCCS believes that at this defining moment, an individual with cancer (and/or a significant person in his or her life) must play a very active role in assuring that they receive quality care. This marks the first step in the cancer advocacy continuum. The next step in the continuum is what NCCS defines as “advocacy for others.” This is where some of the most effective advocacy occurs for individuals with cancer and it is where many people with cancer find a role for themselves as advocates in their own community. At the other end of the continuum is advocacy in the public interest, or national health care advocacy, and this is the chief role of organizations like NCCS. This section touches on all three areas, but focuses principally on self-advocacy, and explains how you can become the most effective advocate when you or someone you care about has cancer.